You’ve definitely heard of rosé, and maybe you’ve even tried Portugal’s vinho verde (green wine) or even the curiously-amber orange wine. But these days, people are dipping their toes into a whole new wine color: pool water–tinted blue wine. Recently, one brand of the wine is taking the plunge in France. The cleverly-named Vindigo has debuted in the French city of Sète where it’s been met with curiosity and some raised eyebrows. 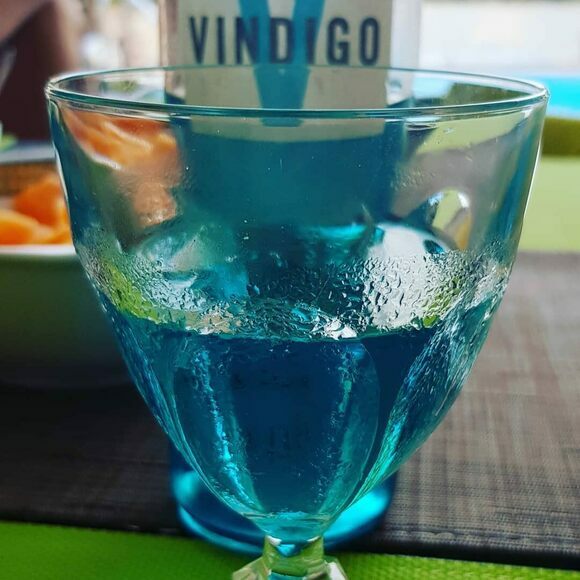 Vindigo’s blue color is reportedly natural, created by filtering white wine through red grape skins to pick up pigments known as anthocyanins. Sweet, with notes of passion fruit and berries, it’s made to drink (and photograph) both poolside and seaside. Vindigo, however, is following in the footsteps of other blue wines that have gathered media interest in the last few years. Many, like blue-wine pioneer Gik, are made in Spain to bypass strict French vineyard standards. Currently, Vindigo sells for 12 euros a bottle. This shop occasionally gets shipments of Vindigo. Check first before visiting.